The incidence of atrial fibrillation (AF) was around 1.5 per 1000 person-years in Taiwan. Systemic thromboembolism is the most severe complication of AF. Risk stratification and adequate thromboembolism prophylaxis is the cornerstone of treatment in AF patients. The CHA2DS2-VASc score is powerful in selecting "truly low-risk" patients who are not necessary to receive anticoagulation therapies. It is also useful in predicting thromboembolic events and mortality for patients undergoing AF ablation. Recently, more and more biomarkers and imaging parameters were reported to be associated with adverse events in AF patients. How could these biomarkers and imaging tools change the current strategy of stroke prevention in AF deserves further investigations. Atrial fibrillation (AF) is the most common sustained arrhythmia in clinical practice, accounting for approximately one-third of hospitalisations for cardiac rhythm disturbances.1 Between 1980 and 2000, the age-adjusted incidence of AF significantly increased from 3.04 to 3.68 per 1,000 person-years in the US.2 The prevalence of AF was lower among African Americans than among Caucasians,3 and it also seemed to be lower in the Asian population.4,5 In a nationwide cohort of 702,502 participants in Taiwan, the AF incidence was around 1.5 per 1,000 person-years.6 Since a considerable number of AF patients was paroxysmal in nature, the incidence and prevalence of AF could be significantly underestimated. Systemic thromboembolism is the most severe complication of AF. It accounts for about 15-20 % of ischaemic strokes.7 AF-related strokes were associated with a poor prognosis as more than 50 % of the survivors remain with a severe deficit, and recurrence may be as high as 12 % per year.8 The risk of AF-related stroke was higher in Caucasian populations than in Asians populations (see Figure 1).4,9-15 AF could in fact drive a prothrombotic or hypercoagulable state, by virtue of its fulfilment of Virchow's triad for thrombogenesis (blood stasis, endocardial dysfunction/damage, and abnormal haemostasis).16 Therefore, stroke prevention with oral anticoagulants (OACs) is central to the management of AF. Since the popularity of catheter ablation of AF continues to escalate,28 understanding the incidence and predictors of TE events after AF ablation is important in determining the strategy of stroke prevention after ablation procedures. 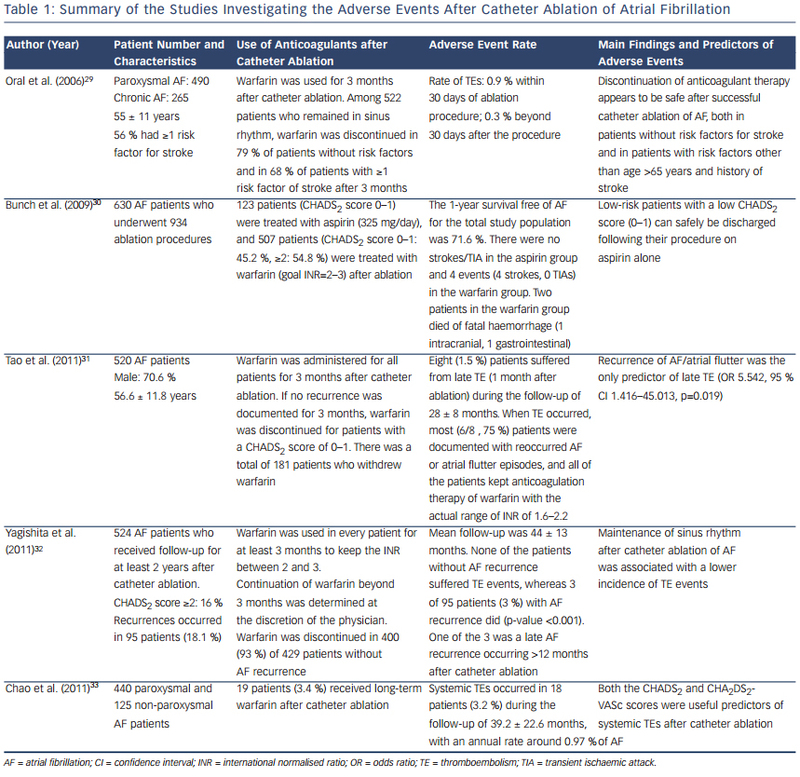 Several studies have reported the rate of TE events after AF ablation, which are summarised in Table 1.29-33 Although these studies differed in patients' CHADS2 scores, strategy of the use of anti-thrombotic agents and ablation procedures, the annual rate of systemic thromboembolisms was lower than 1 % in these investigations. Recurrence of atrial arrhythmias after catheter ablation was an important predictor of TE events, and maintenance of sinus rhythm was beneficial. It may emphasise the advantage of catheter ablation, which can achieve sinus rhythm more effectively for AF patients compared with antiarrhythmic drugs. In the study performed by Chao et al., which enrolled a total of 565 patients receiving catheter ablation,33 CHA2DS2-VASc score was proved to be a useful scheme in predicting adverse events independently from AF type, ablation outcome, left atrial size and left ventricular ejection fraction, and was helpful in identifying patients at risk of adverse events among those with a CHADS2 score of 0 or 1. The result of this study further validated the usefulness of the CHA2DS2-VASc score in predicting TE events in AF patients after catheter ablation. Could Catheter Ablation of Atrial Fibrillation Reduce Long-term Cardiovascular Events? Catheter ablation is clearly superior to antiarrhythmic drugs regarding sinus rhythm maintenance,34 and may improve quality of life of patients. In the study performed by Fichtner et al., which enrolled a total of 133 AF patients, they demonstrated that the quality of life improved significantly three months after ablation in all patients (regardless of ablation success or AF type) and stayed significantly improved after several years.35 However, the effects of catheter ablation on long-term cardiovascular events and mortality were less understood. Bunch et al. compared the risk of adverse events among 4,212 consecutive patients who underwent AF ablation, 16,848 age/gender matched controls with AF and 16,848 age/gender matched controls without AF.36 The results showed that AF ablation patients have a significantly lower risk of death, stroke and dementia in comparison with AF patients without ablation, which suggested AF ablation may eliminate the increased risk of death and stroke associated with AF. In another study performed by Lin et al., which investigated the effects of catheter ablation on long-term major adverse cardiovascular events (such as stroke/transient ischaemic attack, acute coronary events, peripheral embolism and death),37 a total of 174 patients undergoing AF ablation (minimal CHA2DS2-VASc score of 1) were matched with 174 patients receiving medical treatment using the propensity scores. They demonstrated that in AF patients with a CHA2DS2-VASc score of ≥1, catheter ablation of AF reduced the risk of the total/cardiovascular mortality and total vascular events. However, the above studies were retrospective in nature with insoluble limitations, and further prospective trials, such as Catheter Ablation versus Antiarrhythmic Drug Therapy for Atrial Fibrillation (CABANA) and Early treatment of Atrial fibrillation for Stroke prevention Trial (EAST), are necessary to confirm these findings. 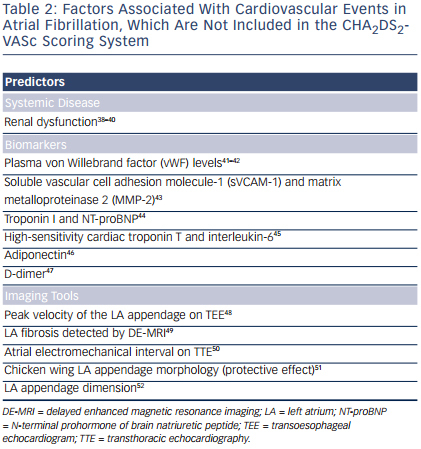 In addition to the clinical parameters included in the CHA2DS2-VASc scoring system, several predictors of adverse events were identified and may potentially refine clinical risk stratification in AF (see Table 2).38-52 Renal dysfunction was demonstrated to be an important risk factor of strokes in AF patients, although it was not included in the CHA2DS2-VASc scheme.38,39 Since patients with renal dysfunction have a high risk of major bleeding despite good anticoagulation control,53 renal function may not be helpful in identifying patients who should receive anticoagulation therapy. On the contrary, normal renal function may be useful in selecting patients with truly low-risk of TE events, and anticoagulation therapy may not be necessary for these patients. In a recent study, Chao et al. investigated the association between renal dysfunction, defined as an estimated glomerular filtration rate <60 millilitres per minute (ml/min) per 1.73 square metres (m2), and the risk of systemic thromboembolisms in 547 patients receiving AF ablation.40 They found that among patients with a CHA2DS2-VASc score of 0 or 1 and with no renal dysfunction, the TE event rate was only 0.3 %. The result suggested that it may be safe to discontinue OACs for these patients after catheter ablation of AF. Therefore, whether the combination of renal function and CHA2DS2-VASc scheme could improve the ability of the CHA2DS2-VASc score alone in selecting truly low-risk patients deserves further investigation. Several biomarkers and parameters derived from different imaging tools were reported to be associated with adverse events in AF patients. In the RE-LY sub-study, elevations of troponin I and N-terminal prohormone of brain natriuretic peptide (NT-proBNP) are common in patients with AF and independently related to increased risks of stroke and mortality.44 Similarly, a recent study from Spain showed that high-sensitivity cardiac troponin T and interleukin-6 could provide prognostic information that was complementary to clinical risk scores for prediction of long-term cardiovascular events and death.45 However, how these biomarkers could change the current strategy of stroke prevention in AF remains unknown. Several recent studies focused on the potential role of parameters derived from imaging tools, such as echocardiography and delayed enhanced magnetic resonance imaging, in predicting TE events in AF. Nevertheless, most of these studies were single-centre observations and further validations are necessary. In summary, risk stratification and adequate thromboembolism prophylaxis is the cornerstone of treatment in patients with AF. The CHA2DS2-VASc score is powerful in selecting truly low-risk patients who do not necessarily need to receive anticoagulation therapies. It is also useful in predicting TE events and mortality for patients undergoing AF ablation. Recently, more and more biomarkers and imaging parameters were reported to be associated with adverse events in AF patients. How could these biomarkers and imaging tools change the current strategy of stroke prevention in AF remains unknown and deserves further investigations. Fuster V, Ryd├®n LE, Cannom DS. ACC/AHA/ESC 2006 Guidelines for the Management of Patients with Atrial fibrillation: a report of the American College of Cardiology/American Heart Association Task Force on Practice Guidelines and the European Society of Cardiology Committee for Practice Guidelines (Writing Committee to Revise the 2001 Guidelines for the Management of Patients With Atrial fibrillation): developed in collaboration with the European Heart Rhythm Association and the Heart Rhythm Society. Circulation 2006;114:e257-354. Miyasaka Y, Barnes ME, Gersh BJ, et al. Secular trends in incidence of atrial fibrillation in Olmsted County, Minnesota, 1980 to 2000, and implications on the projections for future prevalence. Circulation 2006;114:119-25. Go AS, Hylek EM, Phillips KA, et al. Prevalence of diagnosed atrial fibrillation in adults: national implications for rhythm management and stroke prevention: the AnTicoagulation and Risk Factors in Atrial fibrillation (ATRIA) Study. JAMA 2001;285:2370-5. Chiang CE, Zhang S, Tse HF, et al. Atrial fibrillation management in Asia: From the Asian expert forum on atrial fibrillation. Int J Cardiol 2013;164:21-32. Tse HF, Wang YJ, Ai-Abdullah MA, et al. 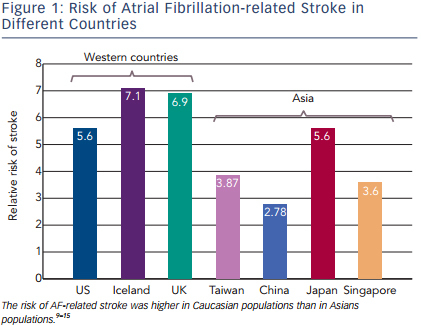 Stroke Prevention in Atrial fibrillation - An Asian Stroke Perspective. Heart Rhythm 2013;10:1082-8. Chao TF, Liu CJ, Chen SJ, et al. CHADS(2) score and risk of new-onset atrial fibrillation: A nationwide cohort study in Taiwan. Int J Cardiol 2013;168(2):1360-3. Lip GY, Lim HS. Atrial fibrillation and stroke prevention. Lancet Neurol 2007;6:981-93. Mattle HP. Long-term outcome after stroke due to atrial fibrillation. Cerebrovasc Dis 2003;16 Suppl 1:3-8. Wolf PA, Abbott RD, Kannel WB. Atrial fibrillation as an independent risk factor for stroke: the Framingham Study. Stroke 1991;22:983-8. Nakayama T, Date C, Yokoyama T, et al. A 15.5-year followup study of stroke in a Japanese provincial city. The Shibata Study. Stroke 1997;28:45-52. Onundarson PT, Thorgeirsson G, Jonmundsson E, et al. Chronic atrial fibrillation--epidemiologic features and 14 year follow-up: a case control study. Eur Heart J 1987;8:521-7. Yap KB, Ng TP, Ong HY. Low prevalence of atrial fibrillation in community-dwelling Chinese aged 55 years or older in Singapore: a population-based study. J Electrocardiol 2008;41:94- 8. Zhou Z, Hu D. An epidemiological study on the prevalence of atrial fibrillation in the Chinese population of mainland China. J Epidemiol 2008;18:209-16. Chien KL, Su TC, Hsu HC, et al. Atrial fibrillation prevalence, incidence and risk of stroke and all-cause death among Chinese. Int J Cardiol 2010;139:173-80. Wittkowsky AK. Effective anticoagulation therapy: defining the gap between clinical studies and clinical practice. Am J Manag Care 2004;10:S297-306; discussion S312-7. Watson T, Shantsila E, Lip GY. Mechanisms of thrombogenesis in atrial fibrillation: Virchow's triad revisited. Lancet 2009;373:155-66. Gage BF, Waterman AD, Shannon W, et al. Validation of clinical classi fication schemes for predicting stroke: results from the National Registry of Atrial fibrillation. JAMA 2001;285:2864-70. Lip GY, Halperin JL. Improving stroke risk strati fication in atrial fibrillation. Am J Med 2010;123:484-8. Lip GY, Nieuwlaat R, Pisters R, et al. Refining clinical risk stratification for predicting stroke and thromboembolism in atrial fibrillation using a novel risk factor-based approach: the euro heart survey on atrial fibrillation. Chest 2010;137:263-72. European Heart Rhythm A, European Association for Cardio- Thoracic S, Camm AJ, Kirchhof P, Lip GY, et al. Guidelines for the management of atrial fibrillation: The Task Force for the Management of Atrial fibrillation of the European Society of Cardiology (ESC). Eur Heart J 2010;31:2369-429. Olesen JB, Lip GY, Hansen ML, et al. Validation of risk strati fication schemes for predicting stroke and thromboembolism in patients with atrial fibrillation: nationwide cohort study. BMJ 2011;342:d124. Taillandier S, Olesen JB, Clementy N, et al. Prognosis in patients with atrial fibrillation and CHA2DS2-VASc Score = 0 in a community-based cohort study. J Cardiovasc Electrophysiol 2012;23:708-13. Potpara TS, Polovina MM, Licina MM, et al. Reliable identification of ÔÇ£truly lowÔÇØ thromboembolic risk in patients initially diagnosed with ÔÇ£loneÔÇØ atrial fibrillation: the Belgrade atrial fibrillation study. Circ Arrhythm Electrophysiol 2012;5:319- 26. Chao TF, Liu CJ, Chen SJ, et al. Atrial fibrillation and the risk of ischemic stroke: does it still matter in patients with a CHA2DS2-VASc score of 0 or 1? Stroke 2012;43:2551-5. Camm AJ, Lip GY, De Caterina R, et al. 2012 focused update of the ESC Guidelines for the management of atrial fibrillation: an update of the 2010 ESC Guidelines for the management of atrial fibrillation. Developed with the special contribution of the European Heart Rhythm Association. Eur Heart J 2012;33:2719-47. Pisters R, Lane DA, Nieuwlaat R, et al. A novel user-friendly score (HAS-BLED) to assess 1-year risk of major bleeding in patients with atrial fibrillation: the Euro Heart Survey. Chest 2010;138:1093-100. Cappato R, Calkins H, Chen SA, et al. Updated worldwide survey on the methods, ef ficacy, and safety of catheter ablation for human atrial fibrillation. Circ Arrhythm Electrophysiol 2010;3:32-8. Oral H, Chugh A, Ozaydin M, et al. Risk of thromboembolic events after percutaneous left atrial radiofrequency ablation of atrial fibrillation. Circulation 2006;114:759-65. Bunch TJ, Crandall BG, Weiss JP, et al. Warfarin is not needed in low-risk patients following atrial fibrillation ablation procedures. J Cardiovasc Electrophysiol 2009;20:988-93. Tao H, Ma C, Dong J, et al. Late thromboembolic events after circumferential pulmonary vein ablation of atrial fibrillation. J Interv Card Electrophysiol 2010;27:33-9. Yagishita A, Takahashi Y, Takahashi A, et al. Incidence of late thromboembolic events after catheter ablation of atrial fibrillation. Circ J 2011;75:2343-9. Chao TF, Lin YJ, Tsao HM, et al. CHADS(2) and CHA(2)DS(2)- VASc scores in the prediction of clinical outcomes in patients with atrial fibrillation after catheter ablation. J Am Coll Cardiol 2011;58:2380-5. Calkins H, Kuck KH, Cappato R, et al. 2012 HRS/EHRA/ECAS Expert Consensus Statement on Catheter and Surgical Ablation of Atrial fibrillation: recommendations for patient selection, procedural techniques, patient management and follow-up, de finitions, endpoints, and research trial design. Europace 2012;14:528-606. Fichtner S, Deisenhofer I, Kindsmuller S, et al. Prospective assessment of short- and long-term quality of life after ablation for atrial fibrillation. J Cardiovasc Electrophysiol 2012;23:121-7. Bunch TJ, Crandall BG, Weiss JP, et al. Patients treated with catheter ablation for atrial fibrillation have long-term rates of death, stroke, and dementia similar to patients without atrial fibrillation. J Cardiovasc Electrophysiol 2011;22:839-45. Lin YJ, Chao TF, Tsao HM, et al. Successful catheter ablation reduces the risk of cardiovascular events in atrial fibrillation patients with CHA2DS2-VASc risk score of 1 and higher. Europace 2013;15(5):676-84. Go AS, Fang MC, Udaltsova N, et al. Impact of proteinuria and glomerular filtration rate on risk of thromboembolism in atrial fibrillation: the anticoagulation and risk factors in atrial fibrillation (ATRIA) study. Circulation 2009;119:1363-9. Piccini JP, Stevens SR, Chang Y, et al. Renal dysfunction as a predictor of stroke and systemic embolism in patients with nonvalvular atrial fibrillation: validation of the R(2)CHADS(2) index in the ROCKET AF (Rivaroxaban Once-daily, oral, direct factor Xa inhibition Compared with vitamin K antagonism for prevention of stroke and Embolism Trial in Atrial fibrillation) and ATRIA (AnTicoagulation and Risk factors In Atrial fibrillation) study cohorts. Circulation 2013;127:224-32. Chao TF, Tsao HM, Ambrose K, et al. Renal dysfunction and the risk of thromboembolic events in patients with atrial fibrillation after catheter ablation--the potential role beyond the CHA(2)DS(2)-VASc score. Heart Rhythm 2012;9:1755-60. Conway DS, Pearce LA, Chin BS, et al. Prognostic value of plasma von Willebrand factor and soluble P-selectin as indices of endothelial damage and platelet activation in 994 patients with nonvalvular atrial fibrillation. Circulation 2003;107:3141-5. Roldan V, Marin F, Muina B, et al. Plasma von Willebrand factor levels are an independent risk factor for adverse events including mortality and major bleeding in anticoagulated atrial fibrillation patients. J Am Coll Cardiol 2011;57:2496-504. Ehrlich JR, Kaluzny M, Baumann S, et al. Biomarkers of structural remodelling and endothelial dysfunction for prediction of cardiovascular events or death in patients with atrial fibrillation. Clin Res Cardiol 2011;100:1029-36. Hijazi Z, Oldgren J, Andersson U, et al. Cardiac biomarkers are associated with an increased risk of stroke and death in patients with atrial fibrillation: a Randomized Evaluation of Long-term Anticoagulation Therapy (RE-LY) substudy. Circulation 2012;125:1605-16. Roldan V, Marin F, Diaz J, et al. High sensitivity cardiac troponin T and interleukin-6 predict adverse cardiovascular events and mortality in anticoagulated patients with atrial fibrillation. J Thromb Haemost 2012;10:1500-7. Hernandez-Romero D, Jover E, Marin F, et al. The prognostic role of the adiponectin levels in atrial fibrillation. Eur J Clin Invest 2013;43:168-73. Mah├® I, Bergmann JF, Chassany O, et al. A multicentric prospective study in usual care: D-dimer and cardiovascular events in patients with atrial fibrillation. Thromb Res 2012;129:693-9. Cianfrocca C, Loricchio ML, Pelliccia F, et al. C-reactive protein and left atrial appendage velocity are independent determinants of the risk of thrombogenesis in patients with atrial fibrillation. Int J Cardiol 2010;142:22-8. Daccarett M, Badger TJ, Akoum N, et al. Association of left atrial fibrosis detected by delayed-enhancement magnetic resonance imaging and the risk of stroke in patients with atrial fibrillation. J Am Coll Cardiol 2011;57:831-8. Chao TF, Lin YJ, Tsao HM, et al. Prolonged Atrium Electromechanical Interval Is Associated with Stroke in Patients with Atrial fibrillation After Catheter Ablation. J Cardiovasc Electrophysiol 2013;24:375-80. Di Biase L, Santangeli P, Anselmino M, et al. Does the left atrial appendage morphology correlate with the risk of stroke in patients with atrial fibrillation? Results from a multicenter study. J Am Coll Cardiol 2012;60:531-8. Beinart R, Heist EK, Newell JB, et al. Left atrial appendage dimensions predict the risk of stroke/TIA in patients with atrial fibrillation. J Cardiovasc Electrophysiol 2011;22:10-5. Wieloch M, J├Ânsson KM, Sj├ñlander A, et al. Estimated glomerular filtration rate is associated with major bleeding complications but not thromboembolic events, in anticoagulated patients taking warfarin. Thromb Res 2013;131:481-6.